Our goal is to provide a fun and professional experience to our clients, with a collaborative design process and impeccable execution throughout every installation project. We are a full-service art and accessories installation company for interior designers, art consultants, facility managers, builders and developers. We help our corporate clients with their entire collections, small or large additions, and the rotation of artwork throughout the workplace. Especially when moving into a new home, placing and hanging pictures yourself can be a real challenge. 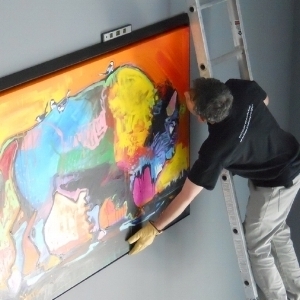 Our installers help you through a collaborative design process and then they securely hang your framed art, family photos, mirrors, craft items, and design elements in one swoop.